There has been lots of crafting going on around here lately, despite the time crunch from the commute (or perhaps because of it – being busy has a way of focusing my energy and getting a lot more done in less time). That’s the “reds” colorway for the fall colors sweater. I think it’s going to work. Very excited. Branden’s sweater has been growing by leaps and bounds, since rounds and rounds of endless stockinette is the perfect way to come off of a 2 hour traffic jam. I bound off the body last night, and have started the first sleeve. I love knitting Branden raglan sweaters; the construction means that the sleeves are already knit to the armpit by the time I split off onto holder needles, so finishing up the rest is much faster than knitting the whole thing in one go. I just finished setting the dye on some samples, and I’m pretty sure I have the colors I’m looking for when they’ve cooled enough to check. Fingers crossed that it comes out like I expect, and I’ll be dyeing the yarn tonight or tomorrow, and swatching soon thereafter. I’ve also been slowly chipping away at teasing open the locks on the Gulf Coast fleece. 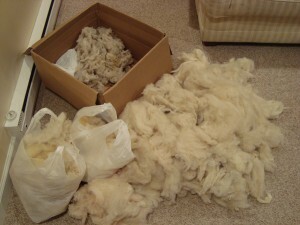 This isn’t my favorite part of fleece processing, truth be told, so I have to do it in spurts here and there. But on Tuesday I finally washed everything one more time to (hopefully) get out the last of the lanolin, and I now have quite a pile of fluff in the basement. That little bit in the box is all that I have left to tease open and rewash, and I’m hoping to do that today, since it means that I can go sit outside and enjoy this glorious weather we’ve been having. 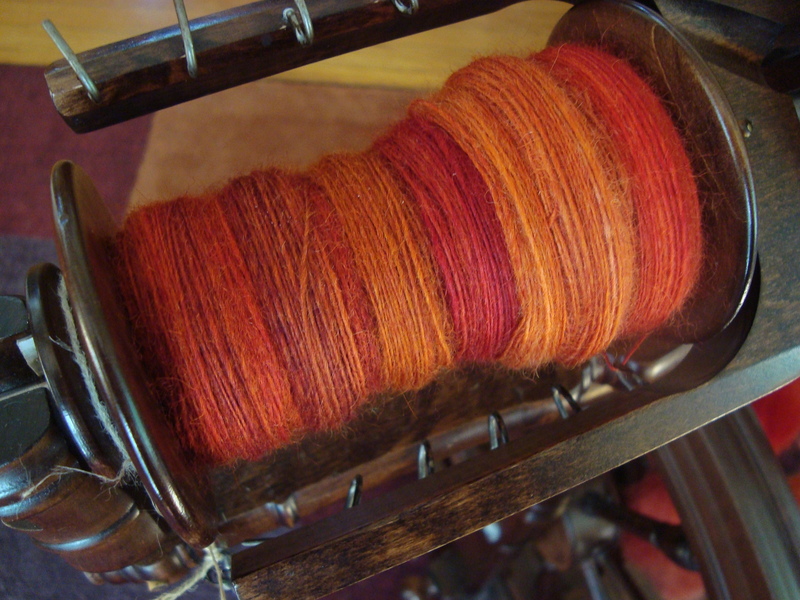 Once the washing is finished, I’ll move onto the combing/carding, which should be more fun, since it will get me that much closer to actually spinning the stuff! I dropped Branden off at the airport this morning; he’s on his way to Austria for a week for work. That leaves me the whole weekend and most evenings to putter around on fiber things, so I’m hoping to finish up a few more loose ends. Or I may just sit and spin the rest of that fall fiber, as it is begging me to do. Doesn’t sound like a bad plan, really. For now, I’m off to wash those samples and see what new colors await! I love the fall reds on your wheel. It surprised me to see that the spun singles look very much like the roving. So often the yarn does not look anything like the roving it came from. I can’t wear those colors but I surely do love them – so nice and deep. Oh, I love those fall colors. I’m itching to return to my fall sweater, but I’m pretty sure it needs the needle in my Rock Island lace. I hope your dying experiments turned out. I understand project start impatience! I exclaimed Ohhh, PRETTY! as that bobbin picture opened up. The celebration of Fall. Yes! I’m loving this new colorway! I can’t wait to see how it turns out once plied with the other single…oh, and I can hardly wait to see the other single! Isn’t it great to have options?!?! I love those colors together, it’s going to be an awesome sweater! DesigKnit is powered by	WordPress 4.8.9 . Page generated in 0.297 seconds using 39 queries.